The common, everyday chicken egg can bring you endless riches and good fortune! AMAZING EGG RITUALS GUARANTEE CONTINUOUS CASH, LOVE, INFLUENCE, AND GOOD FORTUNE! Amazing 'Miracles' Reposted By Readers Of New Book! You think we're off our rocker? Then stop and consider for a moment - the common egg, apart from its obvious nutritional value, has from time immemorial been considered a symbol of the greatest creative power! The ancient Egyptians, the Babylonians, the Greeks, and many cultures right down to this day have considered the egg to be not only the symbol of birth, but also symbolic of the BEGINNING OF ALL GOOD NEW THINGS! 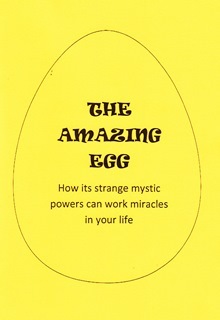 Now - for the very first time anywhere in the world - a book has been published on the age-old mystic secrets of the common egg! And in the short time since its publication our office has been inundated with letters from delighted readers! "My friend was in the depths of despair not knowing which way to turn until I gently suggested using one of the egg rituals. In two days his whole world changed. The transformation is unbelievable. In my own case, my son got the job he had been longing for; my husband received a large salary increase; my sister had a large increase. I could go on and on. Your egg book should be amongst the all-time best sellers. It's the most well thumbed book on our bookshelf". Just think of it - you almost certainly have in your home right now something which could start bringing you the solutions to every problem, and a never-ending flow of good fortune! But of course the egg by itself can do nothing. Only once it has been impregnated with your wishes can its life-releasing mystic powers go to work for you! "When a reader of your book told me about the mystical power of the chicken egg I though he needed his brains tested! But I had know this young man for some time and had suddenly become well-off. He said I should try the egg ritual so I gave in - and then I began to think that I needed my brains tested! I can tell you - and this is the solemn truth - that within three weeks of doing the ritual I won $2000 on the horses and won $1200 in cash and bingo prizes! Before this I had never won a cent! maybe it was coincidence, but I don't mind being though of as 'crazy' if this is what I get from doing the egg ritual!" Perhaps you thinks it's crazy, but remember this; almost all cultures in all periods have regarded the egg as possessing a special spiritual meaning. It does not therefore take a great leap of the imagination to recognize that the egg used as a means for focusing your wishes could be very potent indeed! Not a day passes without our office receiving more amazing reports from elated readers.
" I was broken to pieces when my husband of 40 years suddenly died. I just wanted to curl up and die. And if that wasn't enough I was saddled with a mountain of debts to pay. Mystical stuff never interested me, but when a friend urged me to at least give it a try I said 'What the heck!' What had I to lose - I had already lost the most precious thing in my life. I felt stupid using eggs like this, but it turned out to be the cleverest thing I could have done! Almost as if out of thin air I began to receive sums of money in the strangest way, and two of my creditors wiped my slate clean against all expectations! How do you explain that?" Later, this lady reports she used an egg ritual to end her loneliness - a well-to-do widower then entered her life and offered his hand in marriage! Think about what you want and then use an egg ritual to get it for you! It really is that simple! The simple egg rituals awaken the miraculous luck-creating powers of the Cosmos. In fact at the very moment you perform the ritual you even begin feeling lucky. You know immediately that you are going to succeed! You can perform the simple rituals every day for daily success, or once a week, or once a month, if you wish. The egg rituals will give you just as much success as you need! Think of the person you most desire to share your life with whilst you take the egg in your hands. Suddenly and mysteriously that person will be drawn to you! You have to experience it to believe it! "I admit I was sceptical at first, but I was desperate. I felt my heart was going to break if I didn't get the man I had yearned for so long. For a year he had ignored me. I am not the most attractive looking of women, and it made me want to die when I saw him dating beautiful women. Before I had tried the egg ritual I really felt silly. How can this make him want me?, I thought. But it was the greatest moment of my life. As soon as I took the egg and made my wish I knew that this was it. My spine tingled!" This lady's letter is six pages long so we naturally can't quote all, but at the time she wrote it SHE HAD JUST BECOME ENGAGED TO BE MARRIED TO THIS MAN! EGG RITUALS CAN MAKE SOMEONE GO AWAY! Sometimes in life one wants to be rid of someone instead of the other way round! Is there someone in your life you would rather be without? THERE IS AN AMAZING EGG RITUAL WHICH CAN MAKE THAT PERSON GO OUT OF YOUR LIFE - BY HIS/HER OWN FREE WILL! "Life with my husband no longer had any meaning, but divorce was unthinkable. Deep in my heart I just wished he would go away. It was then that I read your book. A week later I was astonished when my husband said he wanted a separation. We now live apart permanently and he supports me. Technically we are still married (our religion forbids divorce) so I now enjoy the status of marriage without having to see him. I can tell you that this is nothing short of a 'miracle' because previously nothing would make him suggest this. I can't praise the book highly enough, and you may use my testimonial, but please - for obvious reasons do not print my name and address". Whether you have a business partner or a lover, or whomever it is in your life that you would prefer to be no longer around, the mysterious powers of the egg ritual can unquestionably make you wish come true. The amazing egg rituals can also bring people together. They can strife in the home, and bring reconciliation. "'It was because of you he left home! ', my daughter would scream at me. She had never forgiven me for her father leaving, and I could never get her to see that he was a good-for-nothing. I wanted Andrea and I to be friends, but it seemed an impossibility. I tried an egg ritual to see if anything would happen though I really thought I was wasting time. The impossible happened. It seemed like a miracle - Andrea was a new person. I now not only have her respect, but more importantly, her love too. She now even accepts and welcomes my boyfriend which she had previously ignored". "They were always fighting each other, and cared little for school. They showed me no respect and at times they reduced me to tears. I tried an egg ritual in desperation: overnight their behaviour changed. The transformation was so rapid that my husband wondered if they were the same children! He will never know how it happened because, let's face it, he would never believe it. Take it from me - these egg rituals really work!" PROTECTION FROM HARM AND INJURY! These rituals are so simple that even a child can use them! And nor are special psychic powers required. Anyone of any race or religion can use them. They are simple, safe, and above all - effective. They can also ward off all evil influences, and even PROTECT YOU FROM VIOLENT ASSAULT, THEFT AND BURGLARY!